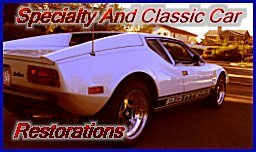 Ridetech Air Ride Technologies not only does air suspension, but they also offer a very superior coil-over suspension system that we use in our Pantera. Ridetech does the vast majority of manufacturing, research and development, CAD drawings, prototyping, CNC machining, CNC tube bending, jig welding, shock assembly and dynoing, airspring crimping and burst testing, and final assembly all within their facility in Jasper, IN. We highly recommend anyone looking for new suspension to head over to our site and check out our selection of Ridetech shocks. You won’t be disappointed.